Pantone's 2015 Spring Color Palette with Lucite Green! Lucite Green is another one of our favorites because it's easy to mix into a Spring or Summer palette - it's kind of like Spearmint, a little like Grayed Jade and a little bit like Hemlock which makes it the perfect shade to ombré! Lucite Green also pairs well with Lavender Herb - a perfect pastel pairing for a Spring wedding or perhaps pair it with a bolder color like Classic Blue for seaside nuptials. Head on over to Polyvore to shop our style board and add a little Lucite Green into your Everyday or Wedding color mix! 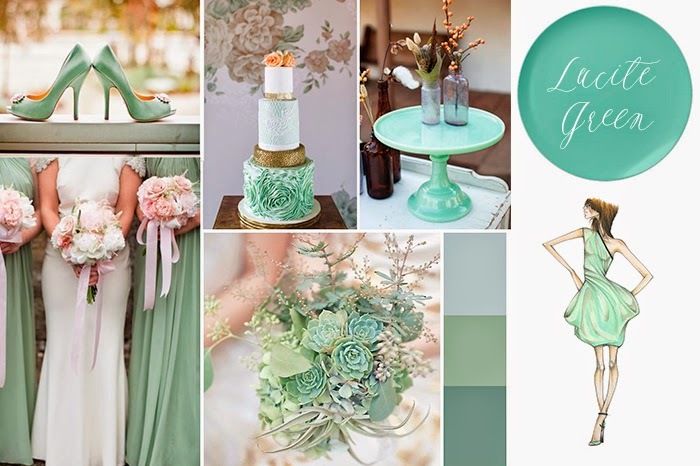 And pin to your heart's content with our Lucite Green Inspiration board for more color pairing and floral inspiration!